In times when “social mobility” was not a fashionable concept yet, the son of a shoemaker could become the foremost expert of the Armenian language as per European standards. Hrachia Adjarian, born in the Samatya neighborhood of Constantinople and blind in his left eye since the age of one, would be a legend in his lifetime and afterwards. In 1883, Adjarian, then seven, started his primary studies at the grammar school of Samatya, where he studied Armenian, Turkish, and French, and finished the entire school course in two years. He then attended the Sahagian School and graduated with honors in 1890. Three years later, he would graduate from the Getronagan School of Constantinople. He taught for a year in Kadiköy and then for another year at the Sanasarian Lyceum of Karin (Erzerum). After writing the first draft of his future Armenian Etymological Dictionary, in 1895 he went to Europe and studied with two eminent linguists of the time, who were also experts in the Armenian language: Antoine Meillet at the Sorbonne of Paris and Heinrich Hubschmann at the University of Strasbourg. He graduated in 1898 from the Sorbonne. A year before, at the age of 21, he was elected member of the prestigious Société de Linguistique de Paris. Adjarian returned from Europe in 1898 to start his career as a teacher at the Gevorgian Seminary of Etchmiadzin, and then taught in Shushi (Gharabagh), Nor Bayazet (nowadays Gavar), Nakhichevan-on-Don (Nor Nakhichevan), Tehran, and Tabriz until 1923. He met his first wife, Arusiak, in Shushi. Meanwhile, he published studies of various Armenian dialects, catalogs of Armenian manuscripts and many other articles and also books. In the period until 1915, his most important works were Classification of dialectes arméniennes (1909), Armenian Dialectology (1911) and Armenian Provincial Dictionary, published in 1913 with more than 30,000 words. He became the founder of a series of branches of Armenian Studies, such as history of the Armenian language, Armenian dialectology, etcetera. He survived the turmoil of World War I, the Armenian Genocide, the massacres of Armenians in Azerbaijan, and found refuge in Iran. In 1923 he was invited to settle in Soviet Armenia and join the faculty at Yerevan State University, where he taught for the next thirty years. He lost his wife in 1925, and later, at the insistence of his friends, he remarried one of his students, Sofia, who would be his faithful companion for the rest of his life. They adopted a daughter, Knarik. In 1926 Adjarian started to publish his magnum opus, the Armenian Etymological Dictionary (1926-1935, seven volumes), which contained 11,000 roots of the Armenian language. In 1937 he was elected corresponding member of the Academy of Sciences of Czechoslovakia. Ironically, in September of the same year, he would be arrested during the Stalinist purges on charges of having been an English spy in Soviet Azerbaijan and a member of a counter-revolutionary group of professors. He was interrogated and beaten on those trumped-up charges. His wife, under great peril, was able to hide his priceless manuscripts. The court condemned him to six years of imprisonment. Adjarian was finally released in December 1939 “for lack of corpus delicti.” He got back his position at the University. In 1943 he would become a founding member of the Armenian Academy of Sciences. In the remaining years of his life, he started to publish some other fundamental works: History of the Armenian Language (2 vols., 1940-1951), Dictionary of Armenian Names (5 vols., 1942-1962), Complete Grammar of the Armenian Language in Comparison with 562 Languages (7 vols., 1952-1971). At the end of his life, he had accumulated over 200 scholarly publications. He left many unpublished volumes, some of which are still being published. 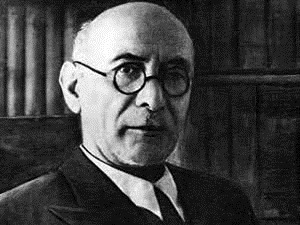 Adjarian passed away on April 16, 1953. The Institute of Linguistics of the Armenian National Academy of Sciences bears his name.